How to Rescue Mac Hard Drive Data? Mac OS uses 3 different types of file systems i.e. HFS, HFS+ and HFSX. HFS (Hierarchical File System) was originally designed to manage and organize data on floppy disks and hard drives. HFS and HFS+ store data in blocks on the Mac hard drive. HFS uses 16-bit block addresses i.e. 65,536 blocks can be allocated to files that are stored on volumes. Therefore, HFS supports only smaller hard drives. HFS+ uses 32-bit block addresses therefore; it is able to support larger hard drives. HFSX is the variation of HFS+ file system, which is specially used on Apple mobile devices. HFSX is case sensitive i.e. it allows the file system to differentiate between two files that have same name. Mac OS X systems also support FAT16 and FAT32 file systems. Launch disk utility then select hard disk, which you want to partition. Select number of partitions that you want from volume scheme. For every partition, give a name and select file system then enter the size for each partition. Now, click Options and then select suitable partition map scheme. Mac systems support 3 types of partition map scheme i.e. GUID, MBR and Apple Partition Map. Click OK and Apply then click Partition. Now, Mac hard disk is partitioned into multiple volumes, each of which works like an independent Mac hard disk. Deletion of partitions after re-partitioning the hard drive: You can re-partition the Mac hard disk using Disk Utility. While repartitioning the Mac hard drive, you may accidentally delete the existing volume resulting in data loss. To safely repartition your Mac hard drive, you need to use third party utilities. Accidentally formatting the volumes: Data may be lost after accidental formatting of volumes. This is because formatting erases all the contents stored on your Mac volume and prepares the partition to store new data. 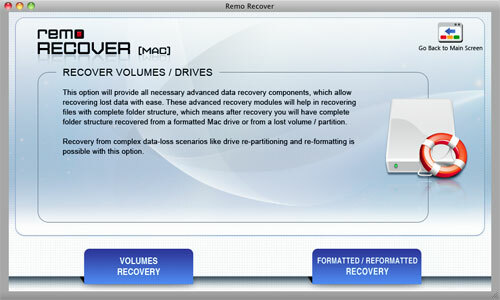 Mac partition revival software can help you reclaim hard drive after format on Mac. Get more tips regarding formatting on this link http://www.recover-hard-drive.org/after-format.html. Volume header corruption: Volume header contains complete information about volumes like volume creation date and time, total number of files stored on volumes, location of other key structures etc. If this volume header gets corrupted then it may not allow you to access data stored on that particular volume resulting in data loss. You may encounter error messages when volume header of volume gets corrupted, which makes entire volume inaccessible. MBR corruption: Mac hard drive uses MBR (Master Boot Record) to load the Operating system during the boot process. In few cases, MBR may get corrupted due to virus attack. When your system reads the infected MBR, the virus instructs it to run the code saved in different location, thereby executing entire virus program into memory that makes your entire Mac hard drive inaccessible. 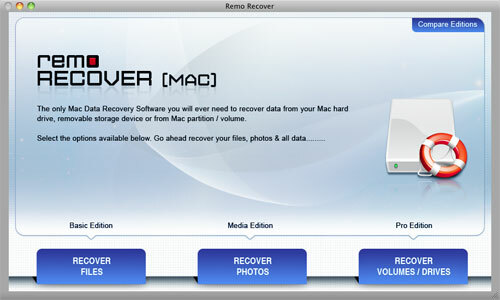 However, you can regain hard drive partition by using a good Mac partition revival software that too in few minutes. Precautions that are to be taken to avoid data loss due to above mentioned problems are, make use of updated Antivirus program, and recheck while formatting unwanted volumes and take backup before re-partitioning the Mac hard drive. If you have lost the data then do not use the affected Mac hard drive for storing or copying new data. This is because the data is not permanently deleted from hard drive; instead only pointers pointing to those particular locations get deleted making that space available for storing new data. If you save or copy any new data then it may overwrite with new data resulting in permanent data loss. Hard Drive Revival software can get back data from lost or inaccessible volumes. This software can bring back data from HFS+, HFSX, FAT16 and FAT32 formatted volumes.This software can be used for undeleting deleted pictures from hard drive along with deleted video and music file types. This software supports Mac OS X 10.5.x and above versions of Mac OS including Snow Leopard, Leopard and Lion. You can also use this software to reclaim data from volumes that do not mount. You can use Hard Drive Resurgence Software to reclaim hard drive on Windows 7, XP and Vista in simple steps. Step 1: Download and install Hard Drive Recovery Software. When you launch the software, the main window is displayed. 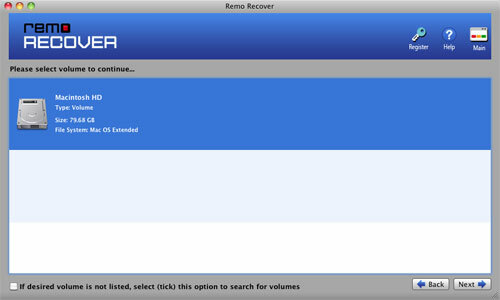 Select "Recover Volumes/Drives" option as shown in Figure 1. Step 2: The next window displays two options i.e, "Volume Recovery" and "Formatted / Reformatted Recovery" as shown in Figure 2. Select appropriate option based on your requirements. Step 3: Select the appropriate Mac volume and click "Next" button as shown in Figure 3. The software starts scanning the selected volume. After finishing the scanning process, the list of recovered data is displayed. 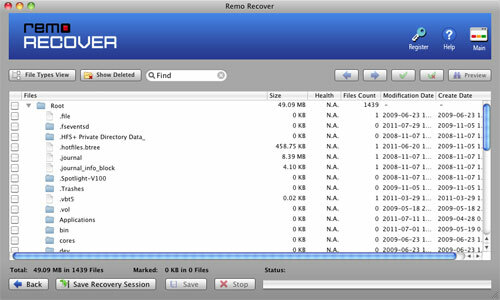 Step 4: View the recovered data using "File Type View / Data Type View" as shown in Figure 4 to evaluate recovery results.